The album cover for Emmaar. True to their heritage as Tuareg nomads, the members of the band Tinariwen have never stopped moving. Since 2001, when the band began to build an audience outside of their desert homeland in northern Mali, they’ve found more and more popularity around the world with their blend of American rock with Arab and African music. In 2007, in the Malian capital of Bamako, they recorded Aman Iman, a collection that Slate said made the case that “Tinariwen is one of finest bands on Earth.” In 2011, they released Tassili, which was named after the Algerian border region where it was recorded, and it won the Grammy for Best World Music Album. 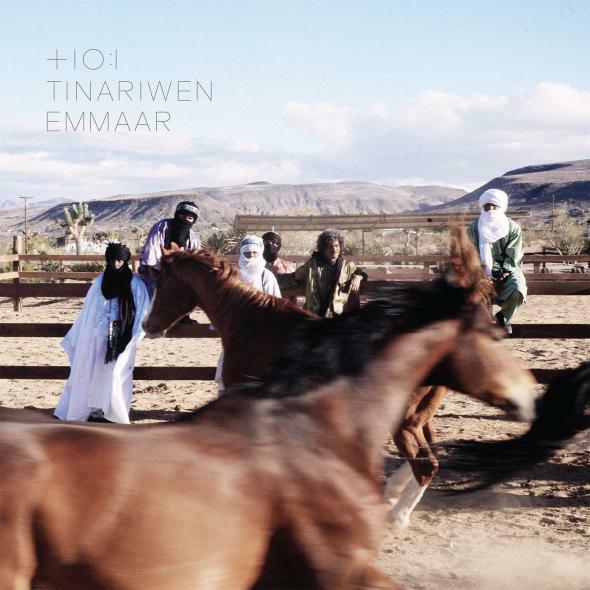 Now Tinariwen (whose name means deserts) is back with another album, recorded in another desert. Emmaar was recorded in Joshua Tree National Park, where the band decided to set up in order to avoid instability in their home country. Slate is excited to help announce the new album and premiere the new track “Toumast Tincha (The People Have Been Sold Out),” along with the song’s music video. Though it was recorded far from Mali, “Toumast Tincha” finds the band looking back at their native country’s troubles. “The ideals of the people have been sold cheap, my friends,” sings bassist Eyadou ag Leche, “A peace imposed by force is bound to fail/ And gives way to hatred.” As ever, the sound is at once familiar and distant, with the band’s signature electric guitars winding in on themselves over hand drums. The video shows band founder Ibrahim ag Alhabib driving through the desert (“Is it the Sahara?” you might wonder at first, “Or is it Joshua Tree?”), before settling once again by another campfire and some more music. In other words, the band is on the move again, trying to make another home.